Whilst 60% to 70% of New Zealanders opposed state asset sales, bizarrely 47.31% still voted for National. This blogger knows two tradesmen who voted National last year despite being vehemently opposed to selling state assets. It’s a quirk of our nature that some folk vote for things they don’t like or support. The assets sale issue is another example of New Zealanders demonstrating a form of political ‘schizophrenia’ and voting for something they dislike. Luckily – despite not having a US-style Constitution to protect our interests from nutty, neo-liberal National Party ideology – our very own Treaty of Waitangi may have pulled our collective backsides out of the fire, and may be the one, single mechanism that puts a halt to National’s unpopular policy to hock off our property. The irony of this should be abundantly obvious to all; the Treaty was orginally designed to protect tangata whenua from the excesses of colonial rule (which was not exactly a stirling success). Now, 172 years after Te Tiriti was signed, our Founding Document may be the means by which Pakeha are saved from their own collective folly. We should hang our heads in shame, and be thankful to Maori. Because of their efforts, our power companies, Solid Energy, and Air New Zealand will not end up being owned by investors from Beijing, Berlin, or Boston. We may just have saved something of our treasures for our children to inherit. So poverty is a result of “poor choices”? I guess that justifies Dear Leader John Key turning his back on society’s most vulnerable. After all, “poor choices” justifies blaming the poor for being poor, instead of having $50 million in their bank account. So Mr Key, how did that free tertiary education and subsidised state house work out for you? Fairfax’s Tracy Watkins and Kate Chapman suggest that, at nearly 45%, “National has enough support for a third term“. But most critically, we should not forget that National went in to the 2011 Elections riding high in polls. For example, one year ago, a Roy Morgan Poll dated 28 July 2011, had National on 52%. 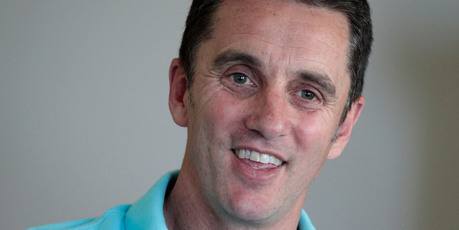 Two previous Roy Morgan Polls had National on 54% (June 13-26, 2011) and 49% (June 27 – July 10, 2011). Another example, using a Fairfax Media-Research International poll, conducted between July 21 and July 25 2011 – again, about a year ago – had National on 56%. Averaging out the 28 July Roy Morgan poll of 52% and the July 21/July 25 Fairfax poll of 56%, gives us 54%. National achieved nothing like that figure on election night on 26 November 2011, gaining only 47.31% of the Party Vote. Not enough to govern alone. National’s support from Election Night has dropped from 47.31% to the current Fairfax Media/Ipsos polling of 44.9% – a drop of 2.41%. But more critically, from July 2011 polling to Election Night voting, National’s support dropped from an averaged 54% to 47.31% – a drop of 6.69%. The reason that this is so critical is that heading into the next election, National’s base polling has to start high, to take natural voter-support attrition into account. Remember; in July 2011, National started high with 54% and 56% in the polls – then dropped to 47.31% on election night. Now imagine if National’s polling stays at around current 44.9% support and heads into an election. Factor in natural voter-support attrition of (for example) 6.69% – and their election night result would be 38.21% – almost precisely the same figure National gained in the 2005 General Election. The above figures are assumptions. But natural voter-support attrition is not, as Labour found to it’s dismay in 2002, after the ‘Corngate’ Affair. With two years left (or earlier, as this blogger continues to predict), and many of National’s unpopular policies continuing to alienate the public, a loss of even 2% or 3% in support will mean the demise of National in power, and a new Labour-led government. If/when Mighty River Power is partially privatised, expect National’s support to drop like a stone in a hydro-storage lake. This is the simple reality that Fairfax neglected to mention in it’s story above. These are people who have made a difference or otherwise stood against injustice and tyranny. They may not always have been successful, but they remind us of the human spirit to resist injustice and instinctively stand up for what they believe is right. 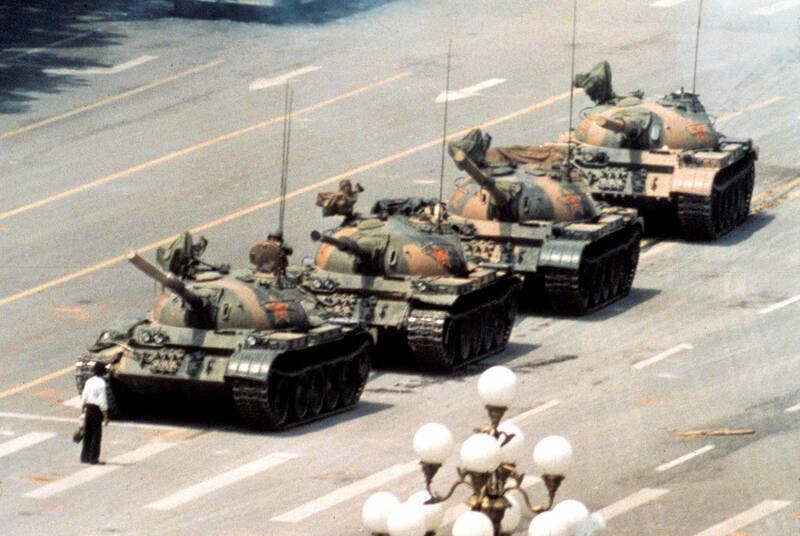 “Tank Man” temporarily stops the advance of a column of tanks on June 5, 1989, in Beijing’s Tiananmen Square. Despite his anonymity, he is commonly (though not necessarily correctly) referred to in Chinese as Wang Weilin (王維林), as dubbed by a Sunday Express article. 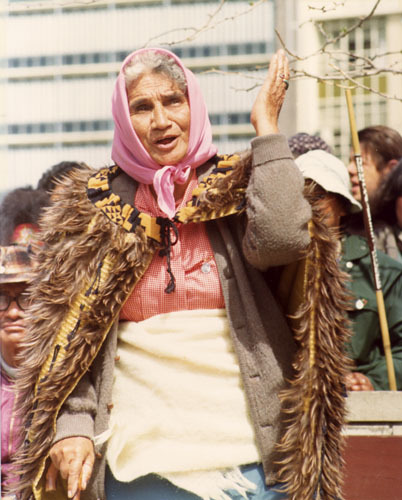 Dame Whina Cooper (1895 – 1994) – Dame Cooper’s land-hikoi in 1975 raised awareness of Treaty breaches and vast tracts of Maori land that has been unjustly seized and confiscated by colonial, and more recent, governments. Without doubt, her courage contributed to the formation of the Waitangi Tribunal in 1975 – a model for addressing grievances from First Peoples throughout the world. 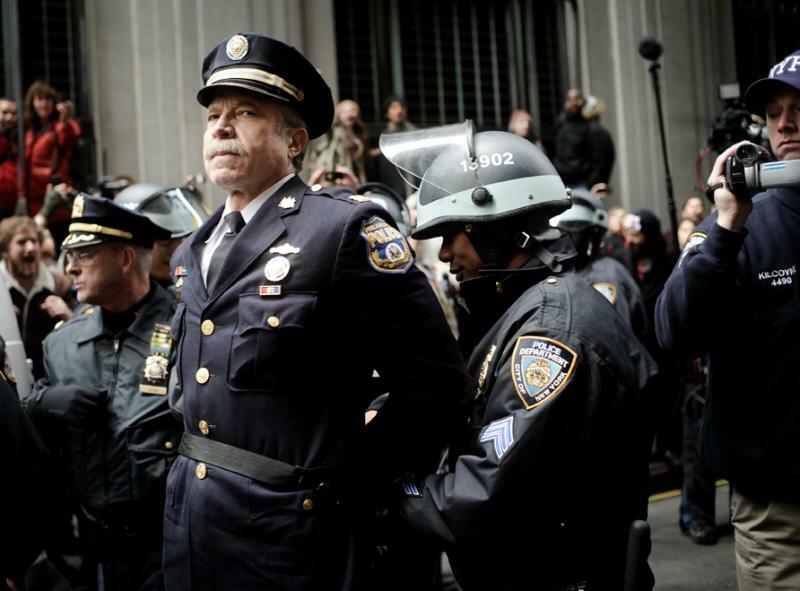 Ray Lewis, the retired Philadelphia police captain who became a hero to the Occupy Wall Street movement when he was arrested on 16 November 2011. 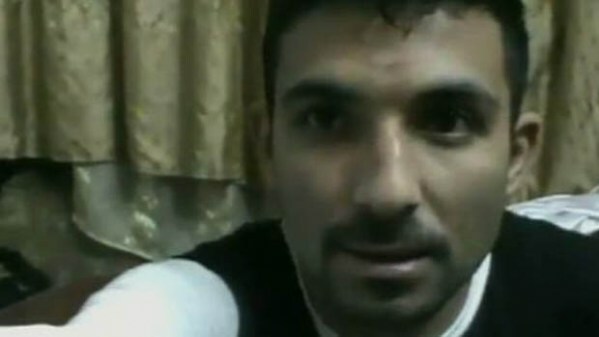 Rami al-Said – Blogger, Citizen Journalist. Killed in Syrian uprising in February 2012, by forces loyal to the tyrant, Bashar Assad. Sue Bradford. Ex Green Party MP. In 2005, a parliamentary ballot allowed the discussion of Bradford’s member’s bill, the Crimes (Abolition of Force as a Justification for Child Discipline) Amendment Bill 2005. The Bill proposed amending Section 59 of the Crimes Act 1961 to remove the legal defence of “reasonable force” for parents prosecuted for assault on their children. The Bill became law after it passed 113 to 8 on 16 May 2007. The Bill sparked widespread debate largely due its depiction as an “anti-smacking” bill. New Zealand has one of the worst rates of child abuse, neglect, and murders in the world. 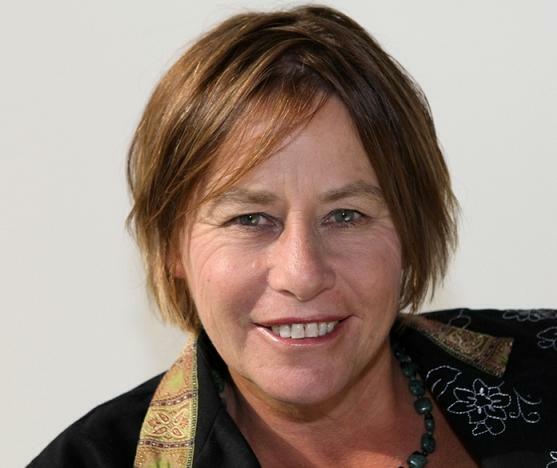 Death threats were made against Ms Bradford in 2007 and 2009, and she was vilified (unfairly), as her Bill was taken up by Labour and supported by National, NZ First, as well as the Greens. 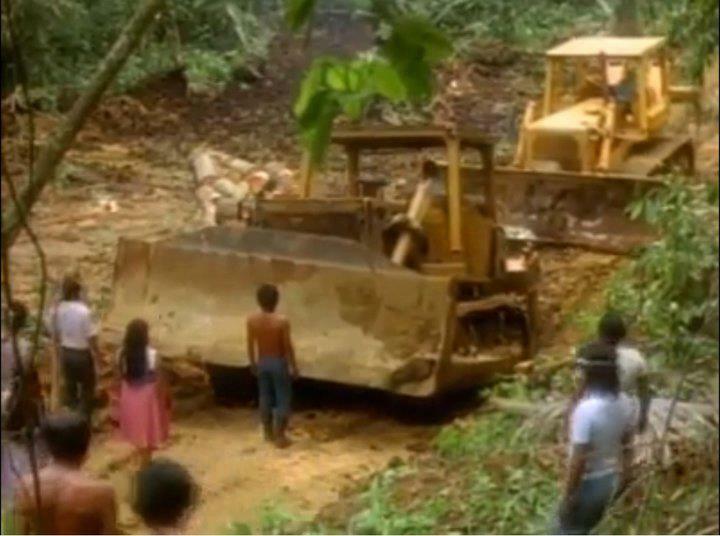 Protester standing against deforestation crews in the Amazon. 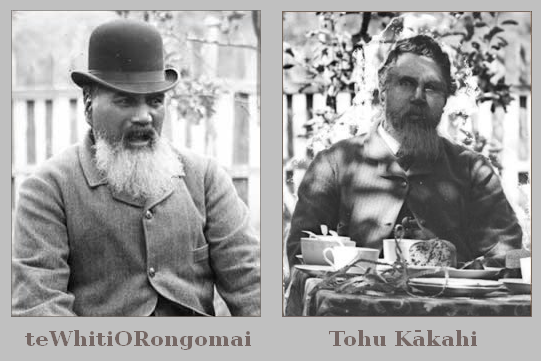 te Whiti O Rongomai and Tohu Kakahi – leaders of the pacifist community of Parihaka, who led a non-violent resistance in the late 1800s, against theft of their land by colonial forces. They based their non-violent resistance on Christian beliefs. 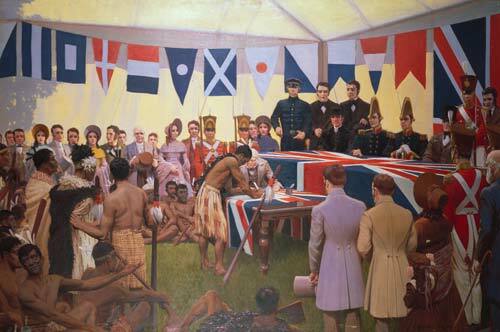 The colonial government responded with 1,500 armed “constables” who attacked and looted Parihaka. 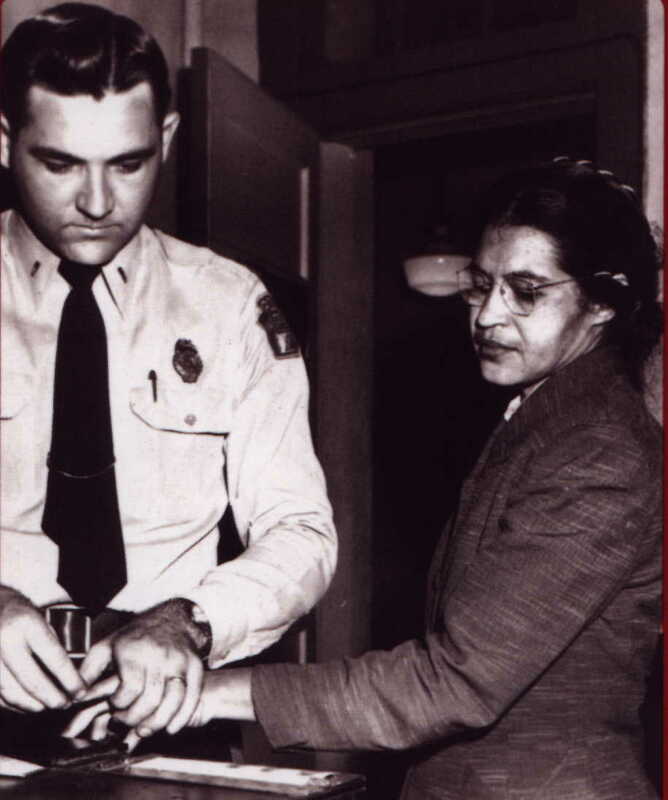 Rosa Louise Parks was nationally recognized as the “mother of the modern day civil rights movement” in America. At a time of legally-sanctioned racial segregation, her refusal to surrender her seat to a white male passenger on a Montgomery, Alabama bus, in December 1, 1955, created a wave of protest throughout the United States. Her quiet courage changed America, its view of black people, and changed the course of history. A previous moral hysteria surrounding welfare beneficiaries and especially solo mums (but never solo dads) took place back in August 2009, when Paula Bennett released the files of two solo-mothers who had dared to criticise the Minister for closing down the Training Incentive Allowance. Despite having no authorisation or right to do so, Bennett released details of the women’s WINZ files to the media and three years later there is still an outstanding complaint against her. It was a nasty, vindictive abuse of Ministerial power not seen since the autocratic rule of Robert Muldoon. Attacks on solo mums reached a hysterical crescendo that could only be described as naked misogyny – especially from a sector of the male population that has never had much success in relating to women. There were vile comments on many internet fora that cannot be repeated in polite company. Time for the government Spin Doctors to swing into action, and deflect attention from National’s apalling track record thus far. Time to dust of the Manual for Deflection, and flick through to the chapter on blaming solo mums (but never solo dads) for the ills of the country; the Black Plague in the Middle Ages; both World Wars; and most likely the sinking of the Titanic. Why not try it again, wonder National’s faceless, taxpayer-funded spin-doctors and strategists, to deflect public attention from scandals and poor management of the economy? New Zealanders (in general) are suckers for this kind of Deflect & Demonise Strategy. It happened in the 1990s. It’s repeating again. It’s pretty much a given that the ACT is now living on borrowed time, and will end up in the political rubbish bin of history. It was never popular with mainstream New Zealand in the first place – New Zealanders having had a bitter taste of it’s ideology in the late 1980s and throughout the 1990s. Events over the last couple of years; last twelve months; and last few weeks, a cascade of scandals and dirty dealings have left the public wondering if lunatics had, indeed, taken over the asylum called ACT. For a Party that advocated the purity of market-driven efficiency, it was prone to one bizarre gaffe after another. They couldn’t even update their own website several months after last year’s elections. So ACT will be gone after the next election. 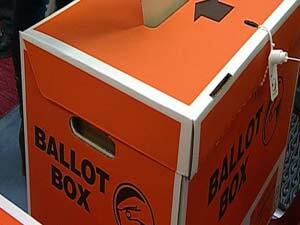 The result has been media, pundit, and public speculation of a new potential Coalition partner for National. There has been recent speculation in the last week or so that Colin Craig’s Conservative Party might make a suitable candidate to shore up National’s numbers in the House. For one thing, does National really want a new coalition partner that appears to be every bit as flaky as ACT? Obviously Mr Craig has, um, “researched” this issue in some depth?! Did he go “undercover“, I wonder? And did he go “one-on-one” with his “subjects“? “… Colin Craig, had suggested New Zealand women were the most promiscuous in the world and therefore should not get taxpayer funded contraception. Key resisted taking the Lord’s name in van and rolling his eyes. Indeed. If the government lasts full term. Which I doubt. National has a problem in this area. It has no viable coalition partner, and is unlikely to find one in the foreseeable future. Part of that reality is based on MMP and how it has affected Labour and National. The Greens, Mana Motuhake, and NLP, had been part of the factional make-up of Labour. MMP simply separated out it’s componants like a laboratory centrifuge. So when coalition talks took place, to form a Labour-led Coalition Government, those same factions simply re-morphed. Before anyone complains that MMP has created a “mess” – not true. These factions had always existed in Labour, and had constantly ‘jockeyed’ for influence within the greater ‘umbrella’ Labour banner. Under MMP, these factions and negotiations were simply forced out into the open, for everyone to see. The same had been happening under First Past the Post, but behind closed doors. This was internal party politics exposed to the glare of sunlight and public scrutiny. National, on the other hand, did not fractionate in such a similar, dramatic, manner. It lost two MPs to the New Zealand Liberal Party (in 1992), Conservative Party (formerly Right-Of-Centre Party), and one to the Christian Democrats. None of those fledgling parties survived the grueling electoral process and quickly vanished into political history. A third party, New Zealand First, had splintered from National earlier, and like Mana Motuhake became a nationalist party, but mainly from a pakeha perspective. ACT was another party on the right, and appeared to draw support from both National and, to a lesser degree, Labour. It remained a small grouping, peaking in 1999 with nine MPs – largely at the expense of it’s larger right wing cousin, National. It’s not that National doesn’t have potential coalition partners. On the whole, National remains intact; a solid bloc of the centre-right. It’s potential coalition partners are already a part of National. National’s only hope of picking up an extra seat or two is to rort the MMP one-seat threshold system, as it did by supporting John Banks in Epsom (with success now mixed with regret, no doubt). It could give a ‘nod and wink‘ to Colin Craig in the Rodney seat, and if he won that electorate, and if Craig’s Conservative Party polled the same as it did last year (2.65%), then it would gain four seats in total. That might give National a chance at winning the next election. It would be seen to be once again manipulating the electoral system. The Epsom deal did not end well for National – do they really want to go down that road again? The Conservatives are opposed to asset sales – so that policy would be off the agenda. How would urban liberal voters view a coalition with a party such as the Conservatives? 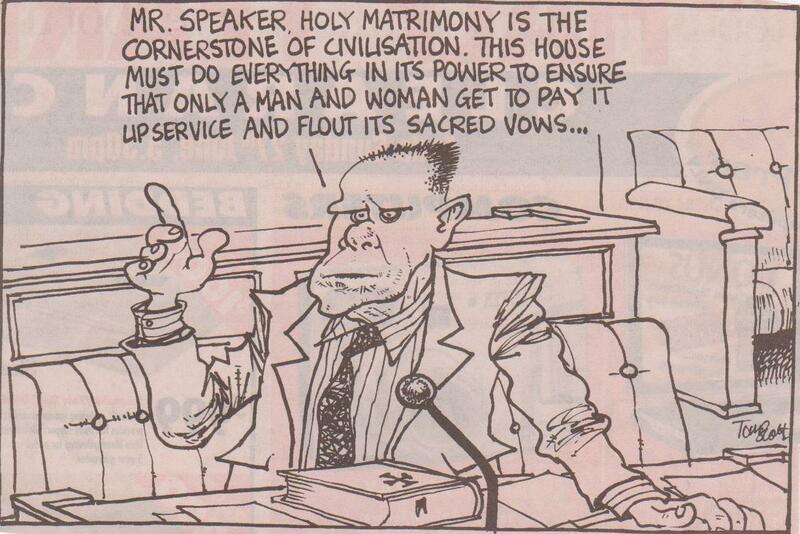 New Zealanders have always been averse to electing overtly religious parties to Parliament (eg; Christian Heritage, Christian Coalition, Destiny New Zealand) and when some of United Future’s MPs were revealed as having a strong religious bent, they were pretty smartly voted out. And would National want a flaky coalition partner with quasi-‘Christian’ overtones, and who seemed to view New Zealand women in a casual Talibanesque-sort of way? How would National’s women MPs feel sitting alongside Colin Craig, knowing that he viewed them as the ” most promiscuous… women in the world “? Craig’s Conservative Party may have a better chance to win seats in Parliament if the Electoral Commission’s review on MMP decides to recommend to Parliament that the Party Vote threshold be reduced from %5 to 4%. Of course, the Commission can only recommend to Parliament, and any decision to reduce the Party Vote threshold will ultimately be up to the National-ACT-Dunne Coalition. I suspect the Nats will adopt the 4% recommendation. Not because it’s fair (get a grip! ), but because anything that assists ACT or the Conservative Party gain seats in Parliament will be welcomed with open arms by the Nats. Self interest rules. The Greens’ submission to the Electoral Commission supported abolishing the Electoral Seat threshold as inherently unfair, and promote reducing the Party Vote threshold from 5% to 4% to compensate for smaller Parties such as NZ First, ACT, etc. This may be National’s one and only “electoral lifeline”, as ACT heads for the political guillotine – especially after John Banks’ incredible performance over his fraudulent 2010 Electoral Donations fiasco. It take a spectacular degree of arrogance to decide that another consenting adult’s relationship is “not normal”. This blogger feels it only appropriate that Mr Craig’s marriage to his wife should be put under the microscope. It has been said often enough that those who vociferously oppose homosexuality (especially in males) often have a measure of sexual insecurity themselves. For many men, condemning and reviling homosexuality has been an attempt to reaffirm their own heterosexuality by “proving their straightness” to themselves. ” He was so sure that homosexuality was a choice, he bet his own sexuality on it. “Do you think you could choose to be gay if that is the case?,” he was asked. “Sure. Sure I could,” he responded. “You could choose to be gay?,” he was asked again. Why are all small right wing parties loony-tunes? Is this the sort of political party that National wants to cosy up to? And more important – would a possible coalition with a bunch of religious homophobes and misogynists really endear National’s voting-base to keep supporting the Nats? Happy times for Dear Leader, John Key. National does have another potential coalition partner – the New Zealand First Party. Though their first attempt at coalition (in 1996) ended very badly for Winston Peters, that could be explained as “growing pains” after our very first MMP election. I doubt if any small Party would ever repeat such horrendous mistakes again. 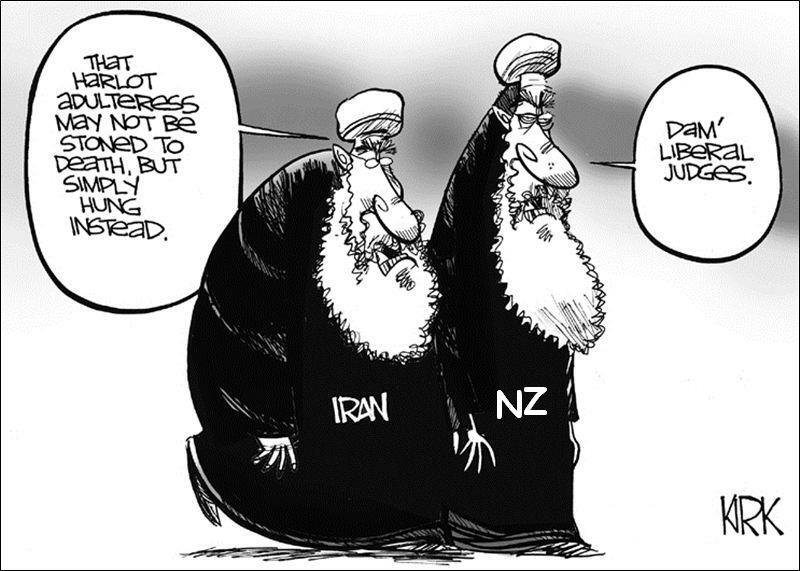 But in coalescing with NZ First, National would have to abandon much of it’s right wing, neo-liberal agenda. State asset sales would be gone by lunchtime. The sale of farmland to overseas investors would be restricted (if Peters is to be taken at his word). And the edge might be taken of other policies favoured by National. On the other hand, NZ First had been punished previously for coalescing with National. As well, NZ First has an active youth-wing that might not appreciate ‘sleeping with the enemy’. Sealing a coalition deal with someone he has categorically ruled out in the past would damage Key’s credibility even further. Our Dear Leader is already developing something of a reputation for being “untrustworthy, dishonest, arrogant, smarmy and out of touch”. Does he want to compound that perception by backtracking on his declaration that he cannot/will not work with the NZ First leader? So Colin Craig it is. Once upon a time, the people of a tiny little nation at the bottom of the world believed that their country lived by laws that applied to everyone. The system was simple; irrespective of who you were and how wealthy or poor you were; regardless of whether you were powerful or powerless, the law applied to all equally. The donations saga began in April of this year, when revelations surfaced that John Banks, MP for Epsom, and a Minister in John Key’s National-led government, was accused of hiding the names of donors in his Electoral Donations return. Instead of listing each donor by name, they were referred to as “anonymous”. The donations were made toward his unsuccessful bid for the 2010 Mayoral election. All were listed as “anonymous”, despite John Banks being fully aware of the donor’s identity. “ ACT MP John Banks failed to declare a $15,000 donation from SkyCity in his return for Auckland’s mayoral election, it has been claimed in Parliament. Labour’s deputy leader, Grant Robertson, said SkyCity had publicly stated it gave $15,000 donations to Len Brown, who is now the city’s mayor, and Mr Banks, who was the main challenger. “John Banks failed to declare a $15,000 donation from SkyCity in his electoral return,” Mr Robertson said, speaking under parliamentary privilege. “SkyCity publicly stated they had given $15,000 to both the main candidates and that they have a policy of asking those who get donations to declare it. ” SkyCity gave $15,000 each to Len Brown, now mayor, and Mr Banks, his rival, during that campaign. ” … Mr Banks said he hardly knew the internet tycoon. He said his contact with Dotcom was limited to a total of 20 minutes conversation and he had been to Dotcom’s mansion in Coatesville only once for dinner. But film of the event – Dotcom’s birthday party – showed Mr Banks making a toast to the tycoon. Staff at the mansion said it was one of three visits. The pair also met at Princes Wharf on New Year’s Eve 2010 when Dotcom put on a $600,000 fireworks display. The pair first met in April 2010 when Dotcom sent his helicopter to collect Mr Banks from Mechanics Bay in downtown Auckland. Dotcom said the pair met in the mansion, sitting at a large square table, and chatted. Bodyguard Wayne Tempero was present, as was one of Dotcom’s butlers. His company chief financial officer also attended briefly. “He mentioned the elections were coming up [and] he was raising money for his campaign,” Dotcom said. “He said it was hard to raise money in New Zealand, the mayoral campaign was coming up and he’s trying to raise funds for that. “I kind of liked the guy. I said, ‘I’m happy to help.’ I told Wayne to write a cheque for $50,000. Dotcom said one cheque was made out in his own name, or the name of his company Megastuff Ltd, and the other in Mr Tempero’s name. “If someone says to me, ‘How can I put money into your campaign?’ what would be wrong with telling them that – if that was that case? Note that John Banks claimed “he hardly knew the internet tycoon“. As events progressed, it became abundantly clear that Banks had lied, and his relationship with Dorcom was more than ” limited to a total of 20 minutes conversation”. ” Kim Dotcom is the latest person to have been found to have allegedly donated money anonymously to John Banks. It is already known that in the race to be super city mayor, Sky City donated $15,000 each to the two front runners. Len Brown listed Sky City as a donor but Mr Banks did not. Campbell Live was interested in that because we had heard Kim Dotcom had made a donation three times that size to the John Banks mayoralty campaign. Campbell Live has even been told Mr Banks was so grateful that he called Dotcom to thank him for it. An investigation found that like the Sky City donation, the Dotcom donation appears to be listed as anonymous. ” Kim Dotcom says the birthday party was not the only occasion Mr Banks visited, saying he once sent his helicopter into Auckland to collect Mr Banks from the central city landing strip at Mechanic’s Bay, and fly him out to the Dotcom Mansion. But Mr Banks does not remember whether that happened or not. “I don’t remember that,” Mr Banks says. When pressed on whether or not he had ever taken a helicopter to the Dotcom mansion, Mr Banks remained vague. “I can’t recall whether I did or not,” he says. Dotcom says Mr Banks gratefully accepted his offer, but Dotcom also says Mr Banks asked for the donation to be split into two payments of $25,000 each. Mr Banks says he does not remember who gave him money. “Well, I don’t know. I mean I haven’t seen the forms now for a couple of years, so I don’t know who gave me money, I can’t remember now,” says Mr Banks. He also says he could not remember discussing money with Dotcom and his team. According to John Campbell, there were no donations from Kim Dotcom listed on Banks’ Electoral returns – but there were five anonmymous donations of $25,000. ” Act leader John Banks asked for a $50,000 political donation to be split into two parts so it could be made anonymously, says Kim Dotcom and one other witness. Dotcom said the request was made on April 15, 2010, when Mr Banks was preparing to campaign for the Auckland mayoralty. Because two $25,000 donations could be listed as “anonymous” under the Electoral Act? ” Electoral officer Bruce Thomas in responding to Mr Mallard today noted that under section 138 of the Local Electoral Act 2001, he was required to report to the police any written complaint alleging an offence had been committed. On the 29th of April, Banks was interviewed on TVNZ’s Q+A current affairs programme. Mr Parker, I would ask you to sit there for a little while, because, Mr Banks, other matters have reared their head over the last couple of days, and David Shearer, the Labour leader, is demanding of the Prime Minister that he stand you down over the Kim Dotcom donation affair. Should he, or shouldn’t you stand yourself down? This is the problem – it’s a sideshow; it’s mostly a media beat-up, and much of it is humbug. No, dammit, it’s about the law, Mr Banks. Yes, well, have a look at the 2001 act and you’ll see what a professor of law said this morning in the Sunday Herald. Yesterday the media had me going to jail. Today they’re saying I’m likely to be in the clear. That is the problem. Last week I was the sideshow. Next week Mr Shearer will be the sideshow because Mr Shearer’s going to be rolled in the next couple of weeks. That’s the problem. Can I just have a look at some of what’s emerged? You were up at Kim Dotcom’s, and did you know he was giving you the money? Did you know he was writing out a cheque or getting his man to write a cheque? Well, I’m sorry, Mr Banks, this has taken precedence. Well, I’m giving you the chance to debate it with us here, so answer the question. Were you there when the cheques came out? Did you know he was giving you the money? Were you there when they started writing a cheque? Did you ask for it to be two cheques because you could make it anonymous? And if you were there and you declared that donation anonymous, you’re dead meat, aren’t you, because that was illegal. I think you think I came up the river on a cabbage boat. I can tell you that when I signed my declaration for the mayoralty I signed it in good faith in the knowledge as a Justice of the Peace as true and correct. I have nothing to fear and nothing to hide and I welcome the inquiry and everything will come out in the wash, Mr Holmes. I’m more invested in the real issues of investment growth and jobs and providing working opportunities for 80,000 of our kids that are out of school and out of luck. But are you saying – because it is illegal, you know, don’t you, that if you know where a donation came from, to claim it was anonymous. So is what Mr Dotcom is saying about – your eyes perked up, your eyes went big at the mention of 50 grand. And so the fella gets the chequebook out and you’re sitting there and he writes a cheque. I mean, are you saying that he’s lying? Because that’s what he’s saying. I don’t know why you’re going on about this. I have nothing to hide. Did you know Kim Dotcom had written you two cheques for 50 grand, and did you therefore put them in your return as two lots of 25, anonymous? Yes or no? Did you know Mr Dotcom was throwing 50 grand at you? Whether or not Key’s statement is factually correct is open to interpretation, as the Prime Minister later acknowledged that he had not spoken directly with Banks. Key rejected calls to stand Banks down, even whilst Police were investigating the Minister. … Mr Banks says he’s done nothing wrong, didn’t know Dotcom made the donations and didn’t phone him to thank him for them. 3News reports Mr Banks met Dotcom in June 2010 and a few days later two $25,000 cheques were banked in Queenstown into Mr Banks’ mayoral fund. They were made out to Team Banks. Labour MP Trevor Mallard stated he was prepared to lay a Police complaint John Banks’ failure to properly disclose Kim Dotcom’s donation, adding to his previous complaint regarding Skycity’s $15,000 donation to Banks, and which also had not been properly disclosed on his Electoral Donation Returns. ” Dotcom has said one of the two cheques paid to Mr Banks was made out in his own name, or the name of his company, Megastuff. The other was in the name of his bodyguard, Wayne Tempero. The Herald last night spoke to a former Dotcom employee, who said they had personally deposited the cheques into Mr Banks’ campaign account. By 1 May, the pressure and mounting evidence had forced John Banks into a corner. Every allegation made by Kim Dotcom had been documented with evidence, witnesses, and even a video of his relationship with Banks. Meanwhile, Banks had nothing but constant protests of “I can’t remember”. “… Mr Banks denied misleading the public about the donations and events around them, including a helicopter ride to Dotcom’s mansion which he has said he cannot remember. Who forgets a helicopter ride? Especially a flight to one of the largest mansions in Auckland?! Which, of course, begs the question as to why a person with such “deteriorating memory” holds a Ministerial Warrant and position of authority in government. Most people with such a poor mental condition would be on extended sick leave. Or in a medical facility receiving appropriate care. ” He specifically referred to an interview which aired Monday on Campbell Live, in which he repeatedly said he “couldn’t remember” his communications with Kim Dotcom. But Mr Banks says the answers he gave on the programme were wrong and admits he was not telling the truth. “I could have quite easily answered all of those questions up front, contrary to the legal advice. “I have never had any problem answering questions in a very straight manner…that is why the public will be surprised I took the legal advice literally, not to jeopardise any inquiry,” he says. Mr Banks still backs his legal standing over the declaration of donations, repeating he has “nothing to fear and nothing to hide”. Which is interesting, as one wonders how John Banks could have had the time to contact his lawyer prior to his interview with John Campbell, to seek legal advice? And why would “his lawyer tell him to keep his lips sealed on the matter”? Generally, lawyers only give such advice only if a person is being interviewed by Police or have been charged with an offence. It seems bizarre to understand why a lawyer would offer such advice. After all, Banks was not a suspect in any criminal case. And any suggestion that a lawyer would give such advice so as ” not to jeopardise any inquiry ” seems unlikely. Remember that the Skycity issue had not been in the public domain until John Campbells first interviewed Banks for the TV3 story; Banks accused of failing to declare donation. 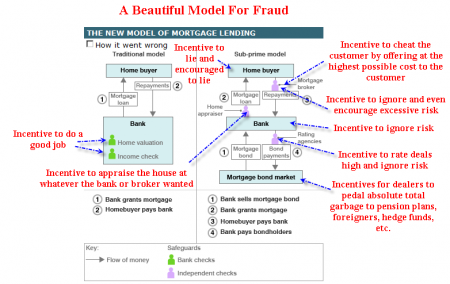 So Banks was forced to admit that he had been – in his own words – “obfuscating “. But then offered a weak excuse that he had “advised by his lawyer” not to answer questions. Does this seem even vaguely plausible? ” 1. Have you actually read the Local Electoral Act? 2. Did you tell Kim Dotcom to split a $50,000 donation into two cheques? 3. What did Kim Dotcom want in return for his donation? 4. You admit advocating for him – when, to who, and on what subjects? ” Mr Key has insisted that he would sack Mr Banks if it turned out the MP had not told him the truth – but apparently that test applies only to questions the prime minister and his office put to Mr Banks directly, not the answers he gave to the media and the public. Firstly, it transpired that John Key hadn’t spoken directly to Banks. Instead the ACT leader had given ”an absolute and categorical assurance to my office” (to Chief of Staff, Wayne Eagleson?) that he acted within the Local Electoral Act 2001. It seems inexplicable that since the story first broke on 5 April, the Prime Minister had not pulled Banks into his office and spoken directly with him to gain a “categorical assurance” that he had complied with the law. Instead, the Prime Minister had left this extremely serious matter to a staffer. Which, in itself, is incredible, as John Key’s Coalition rests on a precarious one-seat majority. If Banks were to mis-calculate and be forced to resign, Key’s government would fall and be forced to hold an early election. The only conclusion one can draw from Key’s decision not to confront Banks directly is that he wanted to keep his Minister at “arms length” from himself. In the world of Political Theatre, this is known as “plausible deniability“. Or, more realistically, Key lied and he had met, secretly, with Banks. ” Land Information Minister Maurice Williamson this morning confirmed Banks had called him in mid 2011 on behalf of Dotcom, who was applying through the Overseas Investment Office to buy his Coatesville mansion. Bank said this afternoon he spoke to Williamson about two times, largely about procedural matters because Dotcom’s application was taking a long time to process. ” Documents released under the Official Information Act show Dotcom wanted to buy the $30 million mansion he was renting in in Coatesville, its $5 million neighbouring “cottage” and a $10 million beach house at Doubtless Bay in Northland. The application to buy the properties went to Mr Williamson, who gave formal approval on April 7 last year. Dotcom’s bodyguard, Wayne Tempero, said he took a call from Mr Banks about the application. The call was to let Dotcom know the application was going ahead as expected and that Mr Williamson had signed it. Dotcom said Mr Tempero briefed him on the conversation. Last night, Mr Banks confirmed he had updated Dotcom’s staff about the application to buy the land. At this point, Prime Minister John Key must have been dreading that another of his Ministers (Maurice Williamson) was being slowly dragged into this mess. – then you know you’re in trouble. “I was not aware that Mr Dotcom had made this donation to my campaign. I did not call him to thank him as the donation was made anonymously. I can confirm that I had contact with Mr Dotcom on other matters, including thanking him for the generous $500,000 donation that he made to the ratepayers of Auckland for the 2010 New Year’s Eve fireworks display. John Banks states that he ” had contact with Mr Dotcom on other matters, including thanking him for the generous $500,000 donation that he made to the ratepayers of Auckland for the 2010 New Year’s Eve fireworks display “. So John Banks is saying that he phoned Kim Dotcom, on 11 June, to thank him for a fireworks display, that was six months away? What part of that sounds even remotely plausible? One would think that Banks had more on his mind – his mayoralty campaign for example – than a fireworks display that was half a year away. John Banks’ assertion that he phoned Kim Dotcom to thank for for an event that was six months away is not credible and obviously Banks lied regarding his reason for phoning Dotcom. On the following day, another ACT member dropped an even bigger ‘clanger‘. “…one of the suggestions made to Dotcom. With that extraordinary slip-of-the-tongue, Simmons had publicly admitted what Kim Dotcom had been alleging, and what John Banks had been consistently andf strenuously denying. Simons retracted within the hour, according to the “NZ Herald“. ” Questions were raised yesterday about a $15,000 gift of “radio advertising” to his 2010 mayoralty campaign. Police are investigating other donations to his failed campaign. Mr Banks admitted yesterday he got a discounted deal at internet mogul Kim Dotcom’s favourite Hong Kong hotel, after initially denying he got cheap rates for the Christmas holiday. Prime Minister John Key continued to back Mr Banks, but still has not talked to his embattled minister outside Cabinet. Labour MP Trevor Mallard said it would be “absolutely weird” that $15,690 worth of radio advertisements could be donated anonymously, especially as they must be approved by a candidate, or his or her nominee. Not only was this allegation of yet another “anonymous donation” further indication that Banks was not complying with the Local Electoral Act – but Prime Minister John Key had still not spoken directly with his Minister. One wonders what was preventing Key with meeting with Banks? Or if he had met, why was it being kept secret? ” ACT leader John Banks has admitted he received a $1000 gift basket from internet tycoon Kim Dotcom, which should have been declared under parliamentary rules. Remember that on 15 April, Banks said “he hardly knew the internet tycoon”. ” Police investigated complaints in respect to donations from Sky City and the internet millionaire Kim Dotcom and the donation of radio advertising from a donor who wishes to remain anonymous. Once again, John Key has mis-represented the actual Police decision to the point where it is now the Prime Minister who could be accused of not telling the truth. Skycity handed a cheque ($15,000 in cash would be difficult to fit into an envelope) to John Banks. Any such cheque would have had “Skycity” or it’s holding company’s name stamped on it. Why was it still recorded as “anonymous”? 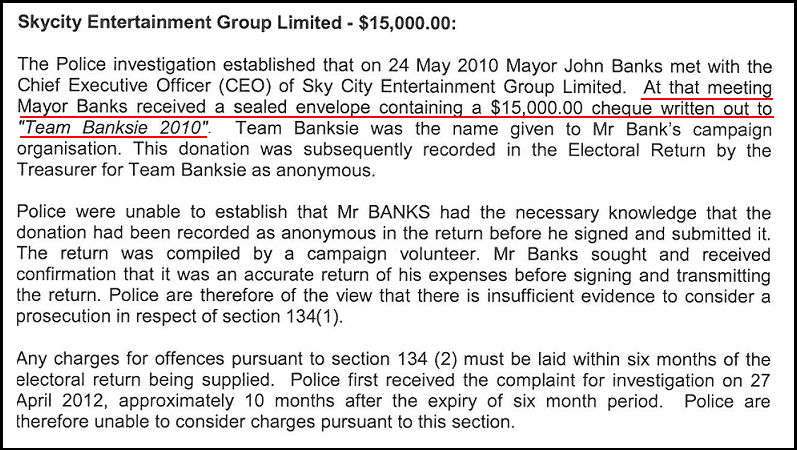 Was the “Treasurer” for “Team Banksie” given instructions to list the Skycity donation as anonymous? Or did s/he make their own decision to do so? A carbon-copy of this Banking Supplementary Deposit form is usually retained within the Deposit book. Why were the details in the Banking Supplementary Deposit book not used to record who deposited which cheque? Did the Police ask these relevant questions and did they sight “Team Banksies” Banking Supplementary Deposit book? John Banks’ mayoral opponant, Len Brown, was able to correctly list “Skycity” as the donor of a similar $15,000 cheque to Brown’s campaign Team. 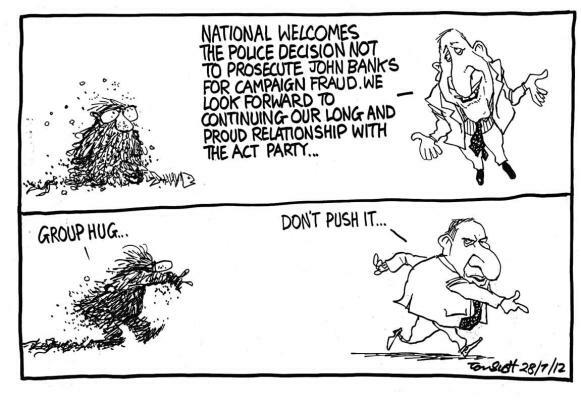 Why was John Banks unable to follow suit? 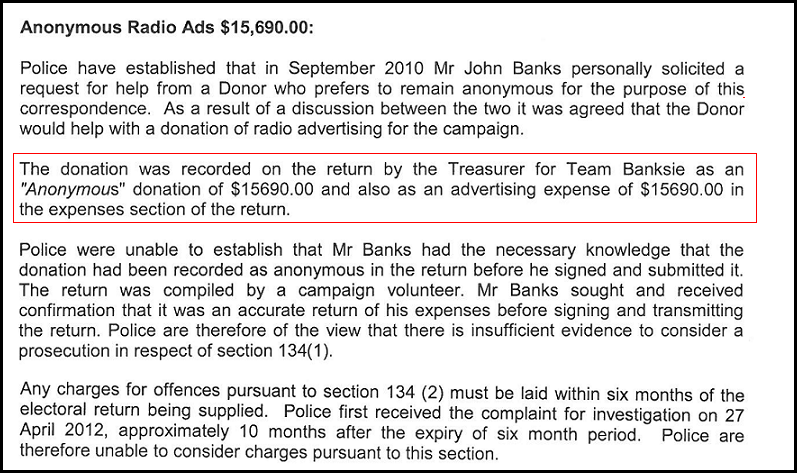 $15,690 worth of radio advertising was recorded as “Anonymous” in the Electoral Return, by “Team Banksie’s” Treasurer. How is it feasible that the Treasurer was unaware of who provided funding for radio advertisements? Was the Treasurer not part of “Team Banksie’s” Campaign Committee? Were publicity and advertising strategies not discussed at “Team Banksie’s” Campaign Committee meetings? How could publicity and advertising strategies be discussed at “Team Banksie’s” Campaign Committee meetings – without setting a budget for advertising, and to which the Campaign’s Treasurer would have had in-put into relevant discussions? Did the Police ask these questions from John Banks; his Campaign Manager; and the Treasurer? A. Why was the $50,000 donation split in two? B. Did they not think this was odd? 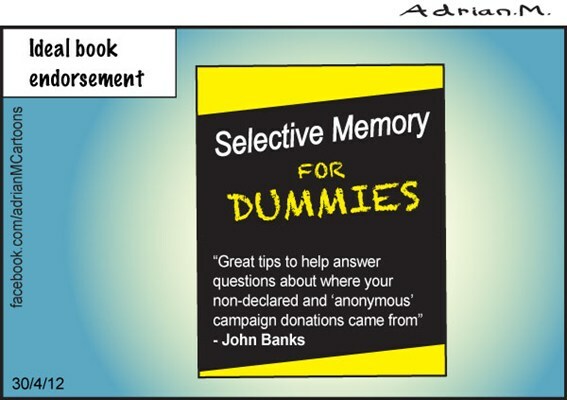 C. Did “Team Banksie’s” Treasurer at any time enquire from John Banks where those three donations had originated from? D. Did Police ask John Banks if he phoned Kim Dotcom to thank him for the donation(s)? E. Did Police take sworn statements from Dotcom’s witnesses? 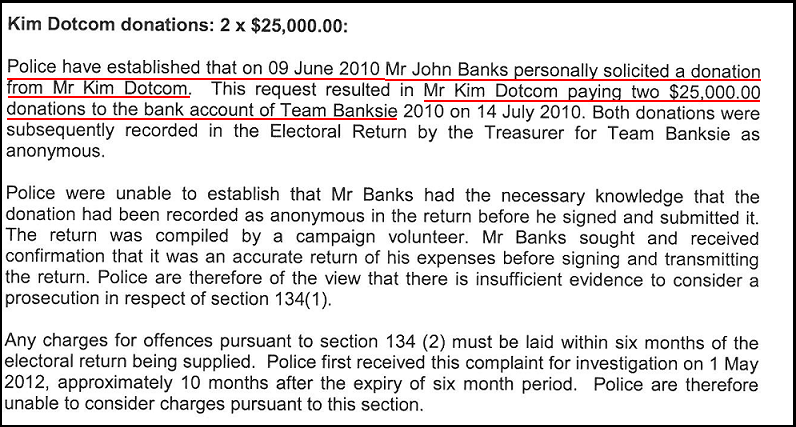 G. Did Police ask John Banks if he advised Kim Dotcom to split the donation in two? If not, why not? H. Why were some donations listed as “anonymous” whilst others provided identifying details of donors? What process was used to differentiate between “anonymous” and identified donors? None of these questions appear to have been addressed in any manner whatsoever. Banks knew that Kim Dotcom had donated $50,000. Banks knew that the amount was split in two lots of $25,000. Banks knew it was done to enable the donation(s) to be listed as “anonymous”. Banks signed the Electoral Return knowing that it was false in a material particular. As an astute reader will notice, there is no reference to any “statute of limitations” in this section. Therefore, this blogger can only surmise at the true reason why John Banks was not prosecuted for breaching section 134 of the Local Electoral Act 2001. The fact that an offender is ignorant of the law is not an excuse for any offence committed by him. The John Banks electoral donations saga illustrates the old maxim that “justice must not only be done, it must be seen to be done“. Compare John Banks with that of ex-Labour Minister Taito Phillip Field, who was charged with 35 counts of bribery and corruption crimes. Field was subsequently convicted on eleven bribery and corruption charges and fifteen counts of wilfully perverting the course of justice. He was sentenced to six years’ jail. 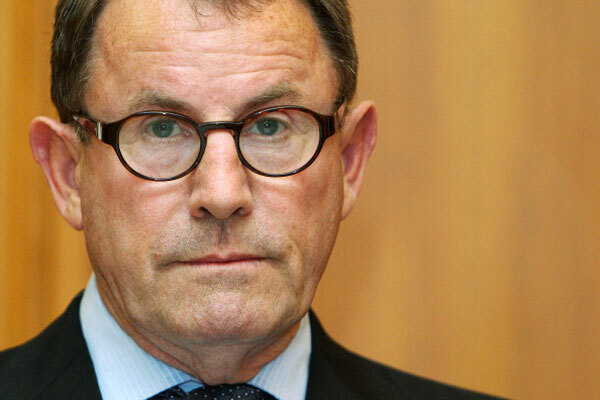 John Banks has escaped justice and will not face his accusers in Court. However, the matter is far from “closed”. With regards to the outcome of police investigation into Trevor Mallard’s complaint regarding John Bank’s Electoral Return for his 2010 mayoral candidacy, could you please provide some details on this issue. B. Did Police not think this was odd? C. Did “Team Banksie’s” Treasurer at any time enquire from John Banks where those three donations (Skycity, radio advertising, and Kim Dotcom) had originated from? I. In a letter to Trevor Mallard dated 26 July 2012, and signed by Detective Superindent Peter Read, Mr Read states “Any charges for offences persuant to Section 134(2) must be laid within six months of the electoral return being supplied. Police first received this complaint for investigation on 1 May 2012, approximately 10 months after the expiry of six month operiod. Police are therefore unable to consider charges persuant to this section.”. Can you please refer me to the section of the Local Electoral Act 2001 that refers to a six month “statute of limitations? For full disclosure and fairness to you, this information will be used as part of a blogpost I am currently working on, and which will be made public. Thank you for your time, and any light you can shed on the matters I have raised. 2. This blogger then contacted Transparency.Org, an international organisation that ranks countries according to the degree of corruption within a particular society. Last year New Zealand ranked #1, from a list of 183 nations. North Korea and Somalia tied-equal at #182. In your organisation’s Corruption Transparency Index 2011, New Zealand rates #1 from a list of 183 countries. I wish to refer you to a recent matter surrounding John Banks, a Minister in New Zealand’s current government, who earlier this year was accused of filing a fraudulent Election Donations return to the NZ Electoral Commission. The full details are covered here, in a report which I have published on my blog: https://fmacskasy.wordpress.com/2012/07/26/john-banks-escaping-justice/. I invite you to consider the contents of my report; to pass it further through your organisation; and to reconsider whether or not New Zealand still deserves it’s #1 ranking on your Corruption Transparency Index. It is my contention that New Zealand has fallen well short of full transparency on this issue, and that the Police complaint laid against John Banks produced a result that is highly questionable and the decision not to prosecute the person in question lacks probity. I look forward to your response, and willingly offer any further assistance you may require in this matter. With regards to matters raised by TV3’s John Campbell, Trevor Mallard, and others, surrounding John Banks; his 2010 Electoral Return; and subsequent Police investigation, I invite you to read and consider questions and comments made on my blogpost, “John Banks – escaping justice“. You will note that I have raised several questions regarding this matter, and have written to Police Asst Commissioner, Malcolm Burgess, for clarification and answers to issues that I regard as important. I have also contacted Transparency International, a global NGO that rates countries according to levels of corruption within their society. Last year, New Zealand ranked #1 on a Corruption Transparency Index 2011. Following the John Banks Donations Affair, I have invited Transparency Internation to review our top ranking, in terms of least corrupt nation on Earth. Far from being a “closed matter”, I believe this issue is of vital importance – especially since it appears that many of Kim Dotcom’s allegations against John Banks have been substantiated. The question that I am asking; will you remove John Banks from his Ministerial roles? This issue is far from closed. In ending this open letter to you Eugene, I have to conclude that either you are staggeringly ignorant and therefore undeserving of your job as a journalist for a major newspaper in such a position to be tasked to investigate and write an “Unauthorised” (let’s face it there was nothing Unauthorised about the whole stinking article) biography of the man poised to become the next Prime Minister or you have sold your soul to the Devil and wrote the article as a PR stunt for the man who is now our Prime Minister but who is in fact one of the Arsonists of the perfect firestorm about to hit this poor small Nation.Either way the only honourable thing to do is to resign.